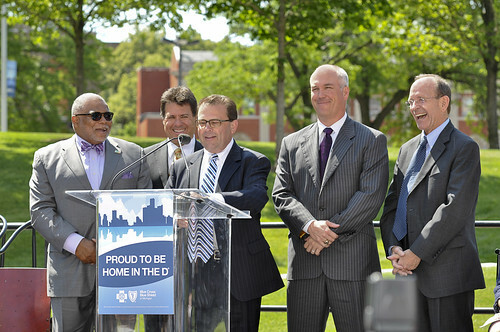 One year ago, five Detroit based companies banded together to annonce the Live Downtown housing incentives.. Employees of five companies — Blue Cross Blue Shield of Michigan, Compuware Corporation, DTE Energy, Quicken Loans and Strategic Staffing Solutions — were immediately eligible for incentives designed to increase the number of residents in Downtown Detroit. As downtown Detroit has become a destination for companies to call home again, many of their employees wanted to call Detroit home as well. The incentives have provided almost 200 people the opportunity to do just that, while giving developers an impetus to rehabilitate existing structures and build new apartments to handle the new found demand. An improving image of the city has been further burnished by this influx of new residents. Buildings long abandoned are being rehabilitated and new construction is working toward completion in hopes of meeting some of the demand enhanced by the Live Downtown incentives. Recruiting new retailers and restaurants has become an easier task as downtown Detroit welcomes each new resident. To celebrate the anniversary of the announcement of the Live Downtown incentives, the five founding companies are holding the Live Downtown Games from July 23 through July 27. Each company will field teams of competitors vying for supremacy on the volleyball court, in obstacle courses, during the field day festivities and in Detroit trivia. This friendly competition has a serious element as well. A canned food drive is being held as part of the competition and each team will be building a canned food sculpture on the Tuesday of the games. The winning team gets bragging rights and additional points toward winning the Live Downtown Games trophy. The real winner of the day will be Forgotten Harvest and the agencies they serve. For more information on the games, including links to daily updates of the competitions, the Downtown Detroit Partnership is providing a one-stop shop for coverage on their website.